For years I have been warning people about RCG’s David Pack. If the highest office in RCG is not an apostle…then I was not sent by Christ. (Pack D. 21st Century Apostle, Sermon part 2, 2005). On November 3rd of 2007, in a move of either desperation or delusion, he essentially ordered his followers to liquidate their assets and send them all to him so that he could build buildings and increase his internet effectiveness (see also David Pack of the Restored Church of God Declares: “Go get those assets and get them here”). I have warned people for years that David Pack is not an apostle, not the leader of the faithful portion of the COG, etc. It sounds to me like he is excessively trusting in money to do the work. While money is needed to do the work, I feel that this was excessive and irresponsible for David Pack to call for people to liquidate their assets at this time. It also seems like covetousness to require what biblically, he is not entitled to. Does not David Pack fulfill the following? …there will be false teachers among you, who will secretly bring in destructive heresies… By covetousness they will exploit you with deceptive words; for a long time their judgment has not been idle, and their destruction does not slumber (2 Peter 2:1,3). Are not RCG followers being exploited with deceptive words? 2007 Income: The Restored Church of God’s 2007 income grew by over 77% above 2006, far exceeding our projection of just under 40%! What RCG failed to report is that the rate of increase is unsustainable unless they greatly increase membership as RCG has been systematically using up the tangible assets of its membership. RCG is in a sense doing what the USA has done–obtained high “prosperity” through debt acquisition–and this is not biblically desirable (please see Deuteronomy 28:44) nor is it ultimately sustainable (see Habakkuk 2:7). Going into debt is not the way of the Bible. As I have not been in Ohio (his location) for some time, I have no idea how the building projects are really coming along, but I did consult Quantcast related to RCG’s projection of “major advancements of our websites”. As the chart shows RCG’s internet reach has been steadily dropping. The previous Quantcast chart showed that a peak of interest occurred about 2-3 weeks after David Pack demanded assets and as the above chart shows, a steady reduction in impact occurred since. And while this may change, it certainly suggests that RCG is not having the type of internet impact in 2008 that it seemed to indicate that it would. Perhaps I should mention that RCG used to show its internet results with a so-called “Download counter”, but it removed the counter a few days after I reported (see http://www.cogwriter.com/9gnews.htm) that it proved that RCG was having less internet impact in 2008 than in 2007. 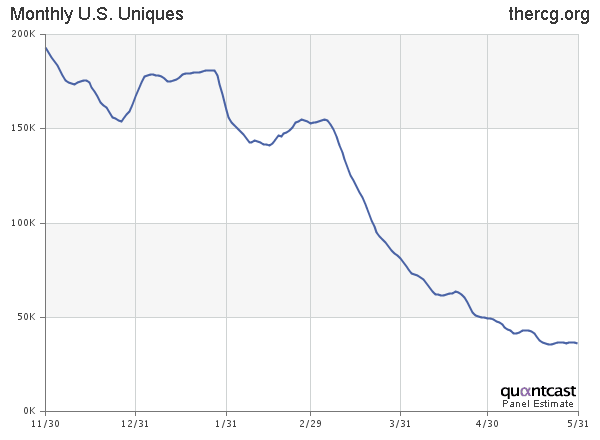 The recent Quantcast statistics also confirm the same trend. While I believe that David Pack has certain talents, I have considered David Pack to be a false leader for years and a false apostle since I first heard himself declare himself to be an apostle. Why Not the Restored Church of God? This group, led by David Pack, claims to be the most faithful. The information in this article suggests otherwise. Why Be Concerned About False and Heretical Leaders? There have been many false leaders–and sadly, David Pack is one of them–here is some of why you should be concerned about them. This entry was posted on Monday, June 9th, 2008 at 1:16 am	and is filed under COG News.